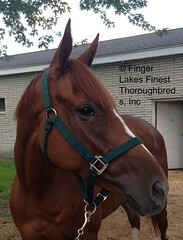 WOW, is all we can say after seeing this flashy, fabulous filly! 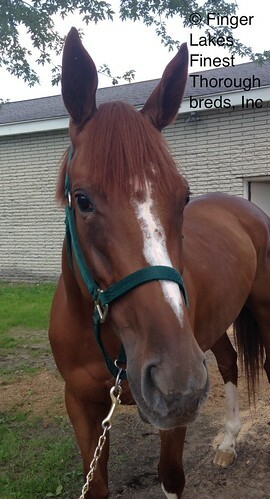 Striking good looks, sound, clean legged, great mover, quiet, good to handle, no vices, and outstanding potential for a sport career in eventing, dressage, or the hunter/jumper ring. 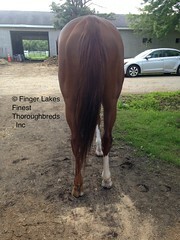 Who can resist her unusual chestnut dots on her white legs, hence her name? 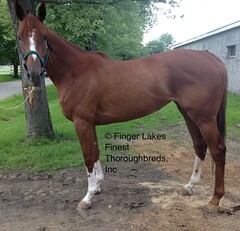 She is lightly raced, and has shown no racing ability, so her owner/breeder has reluctantly concluded that it is best to find her a new career where she can put her looks, movement, and athleticism to good use. She posed like a model for her photo session, and for her jog video she showed off beautiful movement, light, balanced, tracking up well from behind, with suspension and reach, We have been following this filly for over a year, waiting for her to become available, ever since an event trainer who knew her from the owners’ farm alerted us to her outstanding potential as an event or dressage horse. She is by Badge, whose offspring have excelled in eventing and hunter/jumper careers. Her lack of racing aptitude is your gain.